Here I am working in an outdoor studio paradise near Tanglewood, Massachusetts. My husband and I where attending a concert version of “Das Reingold”, by Richard Wagner, perfromed by the Boston Symphony Orchestra. 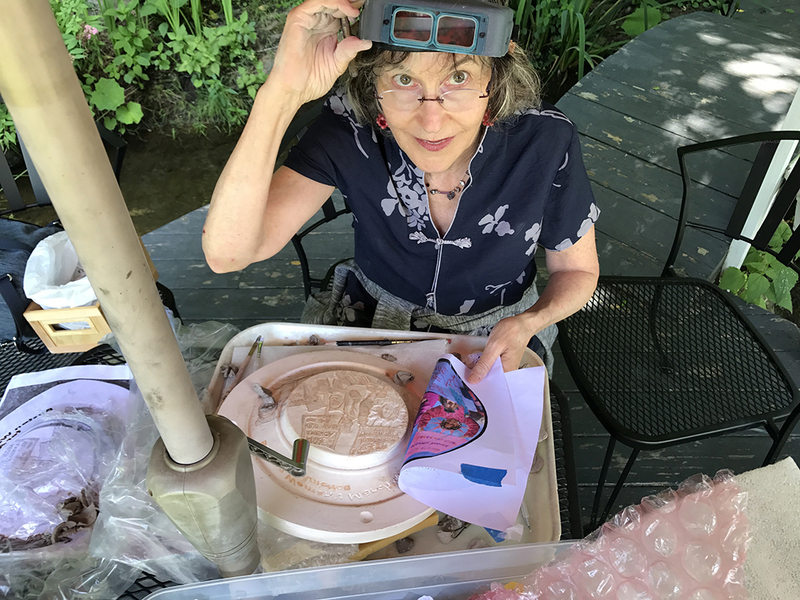 It’s a beautiful day, and I am carving a bas-relief narrative on plaster, making a commemorative plate in a new technique I learned about from Dr. Margaret Carney’s book “Lithophanes”. It’s related in it’s appearance and translucent look to the Lithophanes I learned to make in Hungary at the International Ceramic Studio also called Kecskemét. I have many hours of carving ahead and will reveal results soon. Wish me luck with glaze experiments.